heavy duty front zipper. Water-resistant nylon outer shell. 3.3-oz. • bonded foam-polyester insulation. Nylon lining. M(12-14), L(16--18). See size chart below. Shipping weight 1 pound . ..
3.3-oz.• bonded foam-polyester insulation. Nylon lined. Shipping weight l pound . vent ragged cuffs. Water-repellent nylon quilted shell. 3.3-oz. • bonded foam-polyester insulation. Nylon lined. N6 N95052F-Shipping weight 1 lb. 12 oz. . Boys' Striped Stretch Ski Pants. Front zip . closure. nylon. Stripe is 913 nylon, 93 spandex. Water repellent. Machine wash medium temp. Japan. rayon, 413 stretch nylon. Water-repellent. Japan. Boys'. Front zip closure. Machine wash med. temp. 8, 10, 12, 14 or 16. See size chart below, at right. Girls'. Left side zip closure. Machine wash med. temp. 8, 10, 12 or 14. See size chart below, at right. the middle. Acrylic. Machme wash medium temp. N6 N95988F-Shipping weight 3 ounces . .
tread. Medium width. Sizes 13, 1, 2, 3, 4. State shoe size when ordering. tectors. Steel edges help improve control. straps. Aluminum and rubber rings. Japan. Polyethylene base seldom needs waxing. away strap included. 42-in. steel poles. 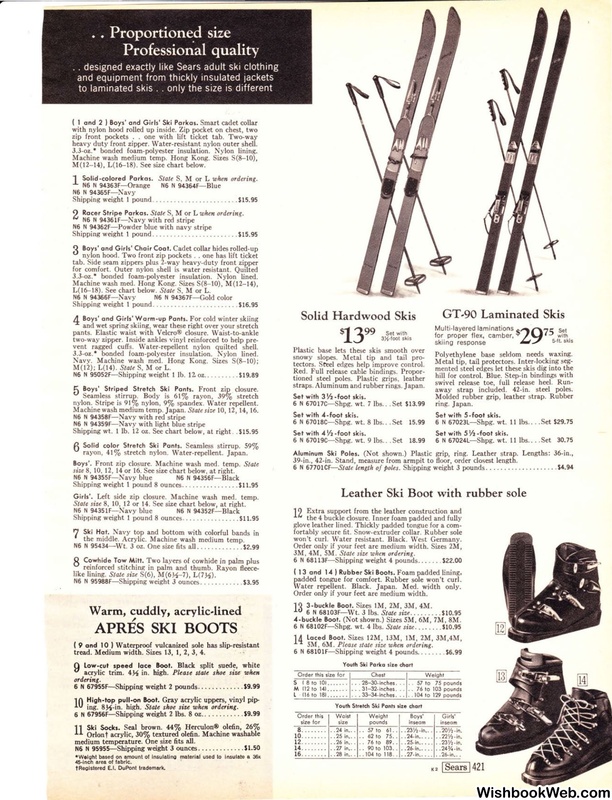 Set with 5 -foot skis. 39-in., 42-in. Stand, measure from armpit to floor, order closest length. won't curl. Water resistant. Black. West Germany. padded tongue for comfort. Rubber sole won't curl. Water repellent. Black. Japan. Med. width only. Order only if your feet are medium width. 3-buckle Boot. Sizes IM, 2M.,3M, 4M. 4-buckle Boot. (Not shown.) Sizes SM, 6M, 7M, 8M. 6 N68!02F-Shpg. wt. 4 lbs. S I 8 to 101 .... . ..... 28-30-inches. . . .
8. . . . .
90 to 103 . .
. . 104 to 118.